TopsOnline provides a manufacturer's warranty for each product that we sell. To learn more about the manufacturer warranties included with each product, please choose your product from the list below. IMPORTANT: Please inspect your item before you attempt installation, to make sure that you received the correct color and product for your car, and that no damage occurred to the product during shipment. Items which have been installed, or for which installation was attempted, may have their warranty claim refused under the provisions set forth on this page. IMPORTANT: Items will not be accepted for credit if installation was attempted. Only brand new items will be accepted in original box. Our product must be folded carefully and returned in the same condition it was received and in the original box. Please inspect your item before you attempt installation, to make sure that you received the correct color and product for your car, and that no damage occurred to the product during shipment. Items which have been installed, or for which installation was attempted, may have their warranty claim refused under the provisions set forth on this page. The manufacturer warranties provided by TopsOnline include the following Warranty Exclusions. Installation: Failure to install products as originally installed may cause damage to the product. The manufacturer is not responsible for damage due to improper installation. Alterations: Any changes in the product will void the product warranty. Acts of GOD or Nature: The manufacturer will not be held responsible for damage caused by acts of God or nature. All claims are calculated from the date of purchase. All claims must be submitted with the original invoices. There are no additional warranties or guarantees expressed or implied beyond what is in this page. Sometimes special situations arise. These situations will be handled on an individual basis. All incidental expenses for down time including, but not exclusive to reinstallation of the product, rental cars, vehicle storage, hotel stay, etc. are the sole responsibility of the purchaser and are not covered by the manufacturer's warranty. Contact TopsOnline's customer service department within 60 days of receipt to obtain return authorization. TopsOnline and the manufacturer will not accept items returned without a return authorization. Shrinkage: All materials, whether canvas or vinyl, will experience some shrinkage and color fading due to the aging process of the material. The manufacturer is not responsible for shrinkage. Thread: All Polyester threads will experience some level of fading over time. The manufacturer is not responsible for fading thread. Top Frames: The manufacturer will not be responsible for damage to the product caused by a worn, misaligned or damaged top frame. Incomplete installation: The manufacturer will not be responsible for damage caused by failure to install Side Cables, Top Pads and/or other necessary components. Xtreme Brand, Bestop Brand, Pavement Ends Brand, and Sierra Brand products do not include a labor allowance as part of their warranty. The manufacturer is not responsible for damage done during installation caused by the installer's inexperience or error. The manufacturer is not responsible for damage caused by using inappropriate cleaning or conditioning chemicals. The manufacturer is not responsible for tears or cuts caused by any accident, laceration due to negligent use of sharp objects on or around the seat cover, or owner abuse. EZ ON Auto Tops Brand and Robbins Brand Convertible Tops and Accessories have an identical warranty. 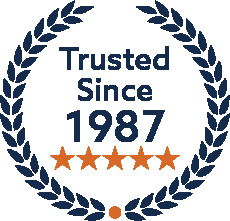 Unless otherwise noted specifically on the product page, EZ ON Auto Tops Brand and Robbins Brand Convertible Tops and Accessories include a 6-year (72-month) warranty, with proration after the 36th month. In addition to the information above, EZ ON Auto Tops Brand and Robbins Brand Convertible Tops are guaranteed for seventy two (72) months, with proration after the thirty sixth (36th) month from date of purchase. The following are covered under the warranty: Cracking, de-lamination of the seams, excessive shrinkage, and severe discoloration. TopsOnline provides the manufacturer's warranty (from EZ ON Auto Tops and Robbins), which warrants convertible tops and accessories, including convertible top window sections, top pads, and top cables, to be free from defects in materials and workmanship at the time of shipment from our premises. If one of the products manufactured should fail or be unacceptable due to defect in manufacturing, any and all adjustments will be done based on description specified above from time of purchase. Labor Allowance for EZ ON Auto Tops and Robbins Brands: If, within eighteen (18) months from the date of purchase by the original owner, an EZ ON Auto Tops Brand or Robbins Brand convertible top product is found to be defective under the terms of this warranty, and if replacement on the vehicle is required, the manufacturer (EZ ON Auto Tops or Robbins) will pay a labor allowance to offset a portion of the labor, up to, but not more than, 100% of the labor cost. The amount of labor allowance will be determined by multiplying the manufacturers estimated installation hours by the manufacturer labor rate in effect at the time of the replacement installation. Unless otherwise noted on the specific product page, the bond to the glass rear window assemblies is covered for seventy two (72) months with no proration for the first 36 months; proration starts after the 36th month from date of purchase. The following is covered under the warranty: separation of the bond between the convertible topping material and glass. There is no warranty for breakage during and after installation. This alternative Window Bond warranty only applies if it is specifically noted on the product page. In addition to the warranty which is included with the purchase of a convertible top with glass window, the manufacturer (EZ ON Auto Tops or Robbins) offers a separate Lifetime Window Bond warranty. 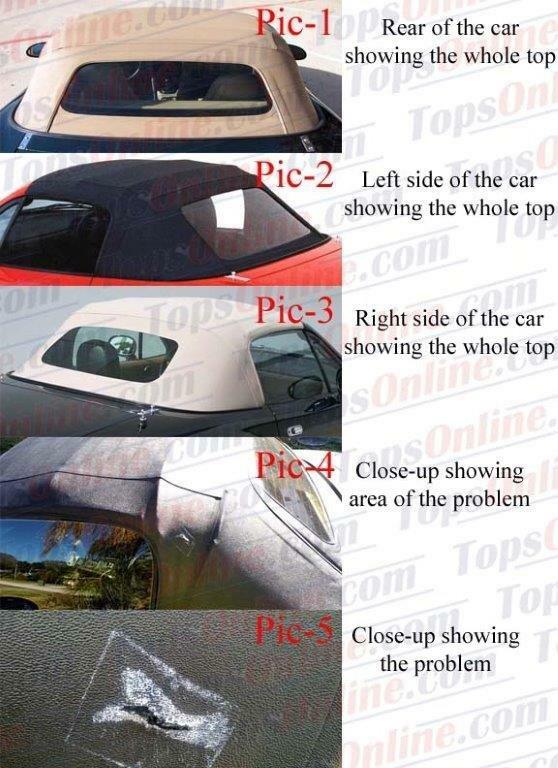 For these tops, if the bond between the convertible topping material and the glass fails or leaks, the manufacturer will replace the convertible top. This warranty is valid for the original purchaser only. Plastic (vinyl) Windows are guaranteed for seventy two (72) months, with proration after the thirty sixth (36th) month from date of purchase. The following are covered under the warranty: separation of the bond between the convertible topping material and the plastic, as well as the zipper (if applicable). There is no warranty for scratches, cracking, discoloration or degradation of the plastic during & after installation. In addition to the information above, TopsOnline provides the manufacturer's warranty for EZ ON Auto Tops Brand and Robbins Brand convertible top headliners for seventy two (72) months, with proration after the thirty sixth (36th) month from date of purchase. The following are covered under the warranty: de-lamination of the seams, and cracking or breaking of plastic components sewn on the headliner. In addition to the information above, TopsOnline provides the manufacturer's warranty for EZ ON Auto Tops Brand and Robbins Brand boot covers, tonneau covers, and well liners for seventy-two (72) months, with proration after the twenty-fourth (24th) month from date of purchase. The following is covered under the warranty: de-lamination of the seams. All Warranty Exclusions outlined in the General Warranty Provisions apply; please read them carefully. TopsOnline Brand Convertible Tops are manufactured for TopsOnline by several different manufacturers. Therefore, TopsOnline Brand Convertible Tops carry different warranties depending on which manufacturer makes the product for TopsOnline. For example, some TopsOnline Brand convertible tops include a 6-year warranty with 18-month labor allowance and a lifetime glass window bond warranty, while other TopsOnline brand convertible tops carry a 3-year warranty with no labor allowance; there are several warranty variations. For this reason, it is important that you rely on the specific warranty language found on the specific product page for the TopsOnline Brand convertible top or automotive upholstery product which you are purchasing. Some convertible tops manufactured for TopsOnline include a labor allowance as part of their warranty; others do not. If a labor allowance is included with the convertible top, that will be noted on the convertible top product page. If no labor allowance is noted on the convertible top page, no labor allowance is included. For those TopsOnline Brand convertible tops which include a labor allowance: If, within the time period noted on the Product Page (either twelve (12) or eighteen (18) months) from the date of purchase by the original owner, a TopsOnline Brand convertible top product is found to be defective under the terms of this warranty, and if replacement on the vehicle is required, the manufacturer (TopsOnline) will pay a labor allowance to offset a portion of the labor, up to, but not more than, 100% of the labor cost. The amount of labor allowance will be determined by multiplying the manufacturers estimated installation hours by the manufacturer labor rate (between $45 to $50) in effect at the time of the replacement installation. The TopsOnline Brand warrants that convertible tops and accessories, including convertible top window sections, top pads, and top cables, to be free from defects in materials and workmanship at the time of shipment from our premises. If a TopsOnline Brand product should fail or be unacceptable due to defect in manufacturing, any and all adjustments will be done based on description specified above from time of purchase. Convertible Tops are covered for: Cracking, de-lamination of the seams, excessive shrinkage, and severe discoloration. Convertible Tops with Glass Windows, and Convertible Top sections with Glass Windows, are covered for: separation of the bond between the convertible topping material and glass. There is no warranty for breakage during and after installation. Convertible Tops with Plastic Windows are covered for: separation of the bond between the convertible topping material and the plastic, as well as the zipper (if applicable). Convertible Top Headliners are covered for: de-lamination of the seams, and cracking or breaking of plastic components sewn on the headliner. Boot Covers, Tonneau Covers, and Well Liners are covered for: de-lamination of the seams. Unless otherwise noted specifically on the product page, Xtreme Brand Convertible Tops and Accessories include a 3-year (36-month) warranty, with no labor allowance. TopsOnline provides the manufacturer's warranty (from Xtreme), which warrants convertible tops and accessories, including convertible top window sections, top pads, and top cables, to be free from defects in materials and workmanship at the time of shipment from our premises. It is important to note that no labor allowance is included under these warranty provisions. If a part fails, the purchaser must contact the selling dealer or installer to determine if the failed part is covered under the terms of this warranty. The dealer will then contact Bestop, Pavement End, or Sierra Auto Tops to process the warranty. The manufacturer will determine if the claim is covered by this warranty and if so, will ship a replacement top to the dealer. The owner will be responsible to pay the deductible charges, if any, to the selling dealer. If it is impractical for the purchaser to return to the selling dealer, then the purchaser may contact the manufacturer's Technical Assistance Help Desk to determine warranty eligibility. Labor costs to replace defective parts are the responsibility of the purchaser. Any part of a convertible top that is found to be defective under the terms of this warranty will be repaired or replaced using either new or reconditioned parts at the discretion of the manufacturer. In determining what constitutes a failure under the terms of this warranty the decision of the manufacturer shall be final. The manufacturer does not undertake responsibility to any purchaser for warranty express or implied by any of its dealers, distributors or agents beyond that which is contained herein. Without regard to an alleged defect of its products the manufacturer, under any circumstances, does not assume responsibility for loss of time, inconvenience, revenue, or other consequential damage including, but not limited to, expenses for telephone, food, lodging, travel, loss or damage to the vehicle the products are installed on or loss or damage to personal property of the purchaser or user of the products. In addition to the information above, TopsOnline provides the manufacturer's thirty-six (36) month warranty on seat covers. The manufacturer warrants all seat covers, and any related trim parts purchased from TopsOnline with the seat covers, to be free from defects in materials and workmanship at the time of shipment from our premises. Defects in workmanship or defective materials. Premature wear-through/cracking of the seating surfaces. Shipping costs to us and back to you for repair or replacement. Warranty is extended to the first purchaser and is not transferable to subsequent owner. Because dye lots on leather & vinyl are different from batch to batch, color matches for repairs or replacement parts are not guaranteed to be exact. The manufacturer reserves the right to repair rather than replace any defective part. Warranty covers and is limited to the replacement of the product exclusively, and does not cover any labor costs or any costs associated with installation. Items will not be accepted for credit if installation was attempted. Only brand new items will be accepted in original box. The product must be folded carefully and returned in the same condition it was received and in the original box. In addition to the information above, TopsOnline provides the manufacturer's Limited Lifetime Warranty, except as noted below, against defects in Materials and Workmanship to the Original Retail End-User and is limited to repair or replacement, at the manufacturer's discretion. All Warranty returns are processed through the selling dealer. This warranty covers only the product itself and not the incidental costs of other parts or labor involved. Warranty does not apply to normal wear and tear. This warranty is void if product has been subject to misuse, negligence, alteration, collision damage or natural disaster. Cloth Products have a 1 year Warranty. Customer Supplied Materials are not under warranty. In addition to the information above, TopsOnline provides the manufacturer's sixty (60) month warranty on carpet kits. The manufacturer warrants its carpet kits to be free from defects in materials and workmanship at the time of shipment from our premises. If one of the products manufactured should fail or be unacceptable due to a defect in the manufacturing, any and all adjustments will be prorated from time of purchase. The manufacturer guarantees its carpet kits against material failure (cracking, delaminating, excessive shrinkage and severe discoloration.) for sixty (60) months. In addition to the information above, TopsOnline provides the manufacturer?s thirty-six (36) month warranty on vinyl landau tops. The manufacturer warrants all vinyl landau tops to be free from defects in materials and workmanship at the time of shipment to the customer. No other warranties are expressed or implied. Warranty is extended to the first purchaser and is not transferable to any subsequent owner. If an item is being returned due to improper fit, the customer must also include the factory original for comparison with our patterns. Failure to do so will void any return due to fitment opportunity. All Warranty Exclusions outlined in the General Warranty Provisions apply;please read them carefully. In addition to the information above, TopsOnline provides the manufacturer?s thirty-six (36) month warranty on automotive headliners. The manufacturer warrants all automotive headliners to be free from defects in materials and workmanship at the time of shipment to the customer. No other warranties are expressed or implied. TopsOnline makes it easy to file a claim for products you purchased from us. Simply follow these steps and TopsOnline will work to serve you and process your warranty claim. Please review the warranty information for your product (above), including warranty exclusions. If you are the original purchaser of the product, if you are not subject to a warranty exclusion, and if you are still within the warranty period described for your product, please gather your original order information and proof of purchase. Next, take pictures of your product for submission to TopsOnline - click here for an example for a convertible top. Be sure your images are not smaller than 800 x 450, and not larger than 1200 x 675. Once you have your images in hand, please email them to us at warranty@topsonline.com. Have questions? Contact our Customer Service Department at warranty@topsonline.com or at (818) 786-2474 and we will help you!